A Hamas delegation will hold what a spokesman called Monday a final round of talks with Egyptian mediators aimed at reaching a long-term cease-fire with Israel. The militant group, which wants a one-year cease-fire in Gaza, says it will base its final decision on the talks in Cairo, which will take place Monday or Tuesday, senior Hamas spokesman Sami Abu Zuhri said. Egypt, a key mediator between Israel and Hamas, is hoping to forge a truce by Thursday. Israel wants a complete halt to Palestinian militant rocket fire that set off its punishing 22-day offensive against Gaza's Hamas rulers, as well as a halt to weapons smuggling. Meanwhile, a missile from an Israeli aircraft struck a car traveling in the southern Gaza Strip on Monday, killing a Palestinian militant and further straining a truce with the territory's Hamas rulers. Israeli Foreign Minister Tzipi Livni, one of three candidates in the running to become prime minister in Feb. 10 elections and an architect of the Israeli onslaught in Gaza, ruled out negotiating with Hamas. Hamas' top demand is the lifting of a crippling blockade on the crowded, impoverished Gaza Strip, including the opening of its borders with Israel and Egypt to allow in desperately needed aid. The crossings have remained sealed to all but a trickle of supplies since Hamas seized control of Gaza in June 2007 from its rivals in another Palestinian group. The Hamas delegation, which will include officials from its exiled leadership in Syria, will be briefed by the Egyptians about their separate meetings with the Israelis. Hamas and Israel do not negotiate directly. Abu Zuhri, who spoke from Damascus in an interview on Al-Jazeera television, again said the group would not negotiate the release of a captured Israeli soldier held in Gaza as part of a cease-fire deal. Sgt. Gilad Schalit was captured in 2006 by Hamas-allied militants. "We have announced previously our rejection of Israeli conditions as a whole," Abu Zuhri said. "In the last meeting there were talks about Schalit, which is an issue that we reject linking to any cease-fire deal." He said talk of Hamas ending efforts to arm itself was also out of the question. "We are a resistance movement and an occupied people and it is our right to possess weapons," Abu Zuhri said. Israel does not want any deal that gives Hamas a role in controlling Gaza border crossings out of concern that that would permit continued weapons smuggling. But putting the borders in the hands of Hamas' rivals in the Palestinian Authority will require a reconciliation deal between the divided Palestinian factions. The president of the Palestinian Authority, Mahmoud Abbas, was in Cairo on Monday for talks with Egyptian mediators trying to reconcile the two sides. On Sunday, Abbas told reporters in Cairo that he would not hold reconciliation talks with Hamas unless it accepts his authority. 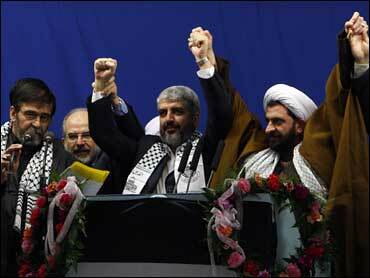 Since Hamas' 2007 takeover of Gaza, Abbas and his government have been in control only of the West Bank. Abbas also was to hold talks in Paris with France's president later Monday in his efforts to build European support for a Palestinian unity government that would include Hamas. He also wants international backing for his demands that he be given a role in Gaza reconstruction and that his troops be deployed at the Gaza border crossings with Israel and Egypt. Hamas, for now, is cool to both ideas. French President Nicolas Sarkozy took an active role in helping broker the current Gaza cease-fire, and French diplomats have been leading efforts for a longer-term peace. Sarkozy met Monday with Qatar's prime minister, whose Persian Gulf country has emerged as a regional mediator. Sheik Hamad bin Jassem Al Thani insisted Hamas should not be sidelined from peace efforts and Arab countries should not play favorites. "We must work for a government of national unity between the Palestinians," he told reporters after the talks. "Arab countries cannot support this or the other Palestinian party against another." "There should not be efforts to delete or distance one of the Palestinian parties present on the ground," he said, referring to Hamas. Also Monday, President Barack Obama's new Mideast envoy, George Mitchell, met with Sarkozy's chief of staff. Mitchell left the presidential palace without speaking to reporters and then met French Foreign Minister Bernard Kouchner for lunch. Mitchell met last week with Palestinian officials including Abbas, whose European tour will take him to the EU parliament in Strasbourg on Wednesday and then to Britain, Italy, Turkey and Poland.